The notification centre has a ‘Today’ tab that lists a brief review of the day, it includes date, day, weather information, calendar entries to inform you the appointments for the day, reminders, up to date stocks and even excerpts of the next day. Here you’ll get a quick look of how’s your day going to be. iOS 7 introduced ‘Control Centre’ to allow you to quickly access all the essential and most used toggles. It is a hassle free way to use the essential features anywhere from your phone. 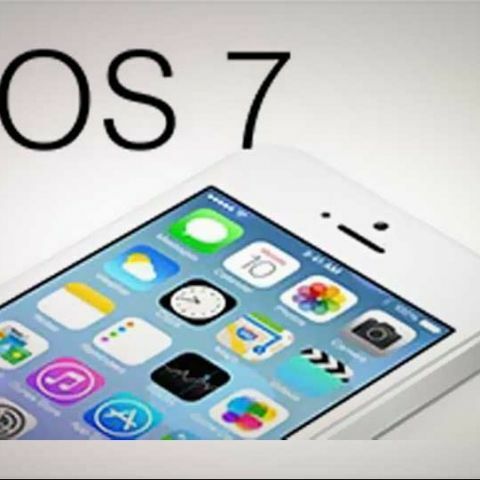 It includes shortcuts for Airplane mode, Wi-Fi, Bluetooth, Do not disturb and orientation lock. Along with this you can also change brightness, control music and volume. No need to go to Settings anymore. It also offers five handy shortcuts – flashlight, compass, calculator and camera. Control Centre can be accessed from lock screen as well, to open it, swipe up from the bottom edge of the screen. Didn’t find Spotlight search? Don’t worry its not gone. Spotlight search is still there in iOS 7 only thing is it is not on its default place. To get the Spotlight search swipe down on the icon grid on any home screen page. Control centre is indeed a very useful feature introduced in iOS 7, but it can be annoying at times. It may accidently pop up while playing a game or scrolling through a list. You can prevent Control Centre to access within apps by navigating to Settings > Control Centre > Turn off Access Within Apps. There’s no need to prevent Control Centre to be accessed from lock screen, but if you’re concerned about privacy we will suggest you to do it. Go to Settings > Control Centre > Turn off ‘Access on Lock Screen’. The notification centre can be accessed from lock screen as well. Though it is handy, it impends privacy as all your notifications are easily accessible. Anyone can easily read the message, reminders, calendar excerpts. It is thus recommended to prevent notification centre access from lock screen. Go to Settings > Notification Centre > Turn of ‘Notifications View’ and ‘Today View’. Newsstand is now more like an app than a part of Home Screen. From what we’ve seen, people used to hate Newsstand because of its inability to hide in a folder. Being a standalone app now it can be hidden into a folder if you don’t like it lying in between your apps. In iOS 6 whenever a new app was installed the app icon showed a ‘New’ banner on it. If you’re lost in finding your new app, let me tell you in iOS 7 the app icon shows a tiny blue dot beside every newly installed and unopened app. The sullen weather app suddenly becomes pleasant with the addition of amazing animations in iOS 7. The revamped app shows cities in tabbed manner. Pinch over the city to get its complete weather information. Tap on the temperature to get more information about it and swipe left/right on the hourly forecast to see it for rest of the day. The iPhone-only apps installed on iPad will get maxed-out interface by default; making it look like an iPad compatible application. You’ll not have to manually switch between the interface anymore. The clock app now readily shows by how many hours you’re ahead or behind the other timezones added. 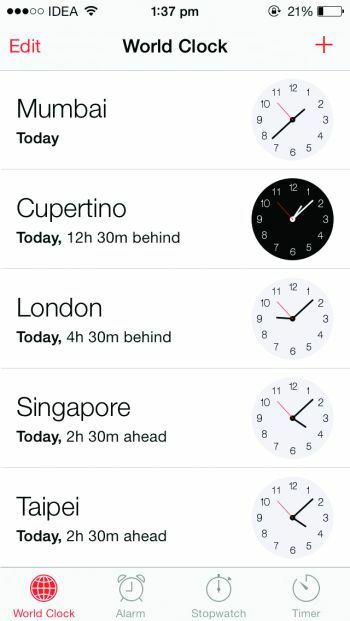 If you want to see by how many hours India is ahead of Cupertino, go to Clock app > World Clock > Tap the ‘ ’ button > Search for ‘Cupertino’ > Tap the result. The Cupertino clock will be added and you’ll see the time lag just right there. Similarly you can do it for other time zones as well.